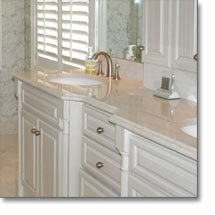 SJ Fisher Construction can assist with your bathroom remodel or new construction. Whether you have a small bathroom or a large master bath, we can help your maximize and update your space. This light and airy master bathroom features raised panel painted cabinets in a beautiful cream color with complementary marble countertop and flooring. The bathroom features dual sinks and mirrors separated by a uniquely updated medicine cabinet. Specialty recessed lighting is built into the cabinetry and the room is supplemented with natural light from off white wooden blinds. An existing bedroom was converted into a walk-in master closet that now adjoins the bathroom.